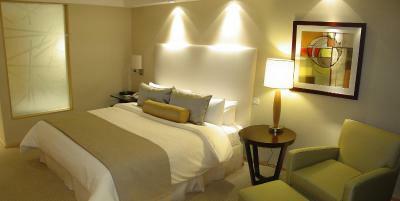 Lock in a great price for InterContinental Mendoza – rated 8.6 by recent guests! The breakfast was ok. Nothing special, but everything good! They gave a luxury suite on the 11th floor. Great view and beautifully furnished. Beautiful hotel with beautiful facilities and reasonable price. Incredible breakfast. Close to airport, for a 1 night stay. And if you want to be close to the mall. Bell boys were charming, with great English and wonderful manners - in fact much more politer than check in and check out staff. Really helpful staff with genuine and friendly attitude. Property is really comfortable to stay in. InterContinental Mendoza This rating is a reflection of how the property compares to the industry standard when it comes to price, facilities and services available. It's based on a self-evaluation by the property. Use this rating to help choose your stay! One of our top picks in Mendoza.InterContinental Mendoza offers a spacious indoor pool in Mendoza, 8.1 mi from the city´s international airport. 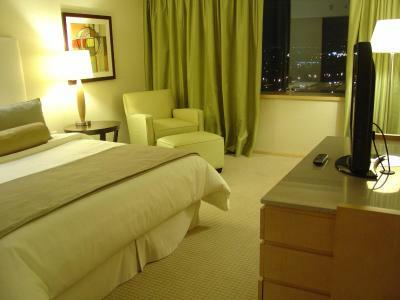 The hotel features air-conditioned rooms with views of the mountains and the city. Free WiFi access is provided. Rooms at the Intercontinental Mendoza have luxurious furnishings, a 32" LCD TV, and a working station with a desk and an ergonomic chair. They come equipped with a mini-bar and safety deposit box. Some rooms have a spa bath in the bathroom. Guests can enjoy a spa, where they can arrange a relaxing massage for an extra fee. They can also visit the sauna facilities and hot tub. The hotel offers various on site restaurants and bars that serve a combination of Mediterranean delicacies, regional flavors and Argentine cuts of meats. The Intercontinental Mendoza is a 10-minute drive from the city center. It offers 24-hour front desk service and luggage storage. When would you like to stay at InterContinental Mendoza? This room features a private bathroom, air conditioning, minibar, and flat-screen cable TV. Extra beds are not permitted in this room. This spacious suite has a flat-screen TV, and a separate sitting area. Extra beds are not permitted. Extra beds are not permitted in this room. With only 6 years old, this hotel was designed for those who want to enjoy their stay. Only 8 minutes from downtown Mendoza, InterContinental is located close to different wineries and other tourist attractions of the region. Nexto to our stunning tower is located the largest shopping center in Mendoza, where you will find entertainment for children in cinemas, bowling and an Amusement Park. This time saved, you will be able to enjoy our luxurious, spacious and harmonious classic-style rooms with a beautiful view of the foothills and city. All our rooms have LCD TVs, minibars, safety boxes, ergonomics chairs and desks. Our indoor pool allows you to enjoy a relaxing bath after returning from work or sightseeing. You will have fun among your family, you can take any of our spa treatments with your partner, or simply enjoy the sun and some delicious drinks on our deck and pool bar with friends. House Rules InterContinental Mendoza takes special requests – add in the next step! InterContinental Mendoza accepts these cards and reserves the right to temporarily hold an amount prior to arrival. Note that the Standard Room bed type is subject to availability. The reception people did a really bad job. I looked for them 3 times and in all of them they didn´t tried to satisfy my request. The last request was really easy to be solved, I just wanted a big car to get us to the airport and they said big taxis doesnt exist!!!! The consierge guy was nice, I would give a 10 for him! Very Nice, very good. Excellent breakfast. water from show-head was really weak. reception was nice, nothing irritating. The staff is absolutely terrible! During the check-in I got +60% blocked on my credit card without any explanation. Only after I asked, they told me that it was a deposit. I thought a person should know that before her money is freezed... The room service is slow and they always mess everything up. If you ask for the empty wine glasses, you'll get glasses WITH wine, if you ask for a fruit salad without any dressing, you'll definitely get it with it. No excuses, nothing. The staff is just looking at you, like saying "OK, what do you want from me now?" I would strongly recommend international team of Intercontinental to educate the local staff, because they ruin all the positive impression from the stay. The swimming pool is small. The gym is just a name. The food is ordinary. The room is big and cosy. Location was not great. Too far from city center for the price. We got a twin bed would have prefered a double, aircon was very loud and noisy. It is located downtown not in the centre to other restaurants. But you can get there by taxi. We arrived very late, at 2:20 am and they said they didn't have my reservation. I have to wait at the front desk more than 30 minutes, because they said they are trying to fix MY problem, which its not! its their problem. I called the day before to the hotel to advised them of may late arrival and they said its ok. But it was not. Finally, they gave us a room with 1 bed, but I asked for 2 twin beds (We slept bad because of that) and also they said the room is only for that night and that the next day we have to wait until the problem were solved. The next morning we spent another time to fix their booking problem, we have to talk with reservation and finally we stayed in the same room with extra beds. Really uncomfortable problems that were not our problem but we paid the cost. They didn't charge for the parking to "make it right". Clearly not enough. Strange smell in the room which was hard to miss.